Hey guys! I haven't talked about my characters in a while, so I thought this week I would do a questionnaire about the main characters in my book, Unperfected. Originally, the story was told from only one point of view (Avalon's) but now I am changing it to two point of views! One from Avalon, and one from her boyfriend Tripp. So today I'll answer questions about Av, and on Thursday I'll answer questions about Tripp. The questionnaire I'm using is called the Gotham Character Questionnaire, and if you would like to do it yourself you can find it here. For those who don't know a single thing about my book, Unperfected is a YA sci-fi taking place in the not-so distant future where the world is completely perfect. Avalon Daley and her boyfriend, Tripp Owens, are two Perfect human beings living in the Perfect city of Society. But when Avalon becomes sick with the Dreams--a terrible disease that destroys a person's Perfect nature--she and Tripp are thrown into a world more imperfect and twisted than they ever thought possible. Yes, yes, I know that was a very basic description. Sorry! It's still a work in progress. That at least gives you a little bit of information regarding the story. And now, more about Avalon! Avalon Olivia Daley. Tripp (her boyfriend) calls her Av, and Ashton (her brother) calls her Av or Squirt. Avalon’s skin is completely flawless due to her Perfection and time in Society. That and her already striking natural beauty make her very different than most people in the story. Nope. Like I said above, Avalon has perfect skin. 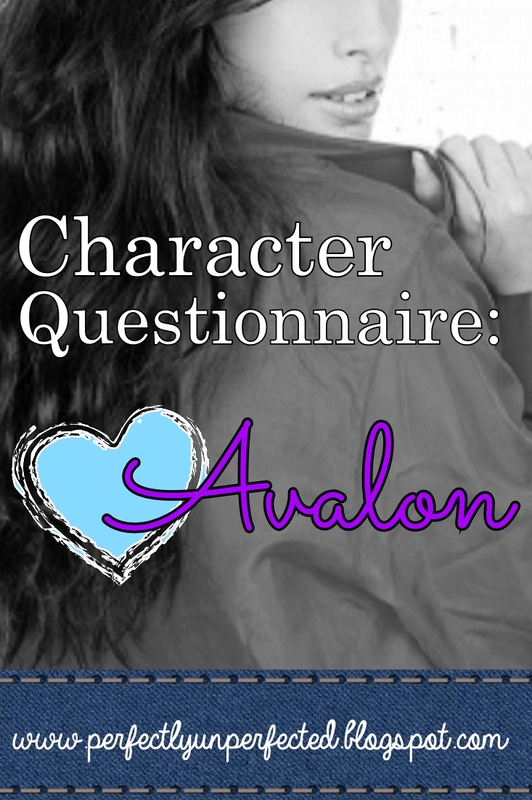 Avalon’s friend group (in book one) consists of: her brother Ashton, her boyfriend Tripp, a spunky blonde named Emily, Emily’s goofball-with-anger-issues boyfriend Sam, and the daughter of the rebel base commander, Cassidy. At first, Avalon spends most of her time with people from this group in sections. She’s either with Cassidy and Emily, Emily and Sam, just Tripp, or just Ashton. She rarely hangs out with everyone all at once. If she could choose one person to be the closest with, it would probably be Ashton or Tripp. The geography in the book isn’t the same as what we know now, but Avalon was born somewhere around Elkhart, Indiana. Since then, she’s lived in Society (present day Cincinnati). Due to her time in Society, Avalon doesn’t really know what home feels like. Somewhere quiet where she can be alone. If it’s available, a roof or library. Avalon’s biggest fear is losing the ones she loves. She hasn’t told anyone, really. Avalon’s not very open about things. At the beginning of the book, yes: she's having the Dreams. Anything ridiculous, like Emily and Cassidy putting makeup on Sam while he sleeps or all of them having a big food fight. Or when she’s tickled. But tickle Av, and she’ll laugh out loud and then hit you. Both in the course of the book! Hmmm . . . Avalon doesn’t actually know of very many foods because there wasn’t much variety in Society. So no idea. There would be nothing on her floor because she is a neat freak. On her nightstand she would have the key necklace her dad gave her and her tracker bracelet from Society. Her garbage can would honesty probably be emptied out every day. She doesn’t do messes! Avalon wears a size 7 shoe, usually boots of some kind. Whatever is available, really. In Society the uniform shoes were plain white loafers. At the Base, she usually borrows Emily’s shoes, which means cute, comfortable pairs in a variety of styles and colors. Avalon and her family didn’t have their own kitchen when she was a child; they would eat in the cafeteria, so Avalon would probably associate the smell of different foods and people in the room. Everything is easy to be thrown out. Avalon doesn’t keep unnecessary things. She keeps sentimental items, but if she doesn’t use it or need it, it’s gone. The strongest memory Avalon has from childhood is her and her family having a picnic outside and her mother offering her a dandelion and telling her to make a wish. This memory is so strong because it's a recurring memory and plays in her mind a lot throughout the book series. Avalon would be going out with Emily, and she would be wearing something Emily picked out and going somewhere Emily wants to go. Avalon doesn’t like going out. She’s a major introvert and cringes at the sound of a busy night or party. So there you have it! Some interesting facts about Avalon. I personally love doing these questionnaires because they always teach me something new about my characters. For example, I had no idea Avalon was such a neat freak. It makes sense, but I didn't know! Again, if anyone would like to do this questionnaire, you can find it here. Check back on Thursday for some cool information on Tripp!